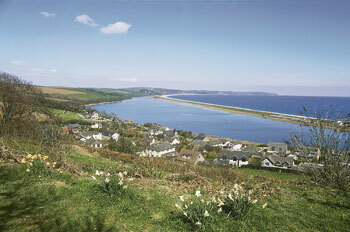 Thatcher Rock is quietly set in a popular village just 100 yards from Slapton Ley (pictured), a freshwater lagoon and bird sanctuary, separated from the sea by a huge, curving pebble beach. 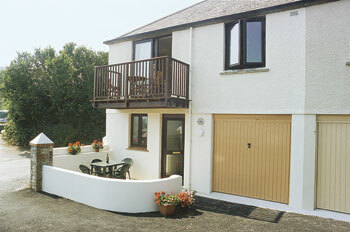 Designed to incorporate lovely views, it is just 400 yards from shops, pubs, beach and coastal path. The sailing resorts of Darmouth or Salcombe, and the market town of Kingsbridge are all within easy reach, offering excellent golf, swimming, leisure facilities, river boat trips and steam train rides. Sandy beach 3 miles. Entrance hall. Pretty double bedroom with ensuite shower room/W.C. Single bedroom. First floor: Well equipped kitchen, part screened from very comfortable sitting/dining room with patio doors to balcony with sea views. Twin bedded room. Bathroom/W.C. (shower over bath).